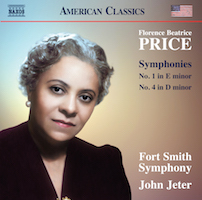 Florence PRICE: Symphony No. 1 in E minor (1932); Symphony No. 4 in D minor (1945). Fort Smith Symphony, John Jeter (cond.). Naxos 8.559827 (1 CD) (http://www.naxos.com/). Price is experiencing a resurgence for all sorts of good reasons. Every reviewer and annotator of these works cites Dvořák whose Ninth with its European form and American flavors established a stylistic precedent. But it’s also important to mention Chadwick and Beach who were strong early 20th-century models. We know that Price encountered sexism and racism, but after moving to Chicago in 1927, her musical career began to flourish. Her unassuming symphonies demonstrate a sly disinterest in probing the boundaries of four-movement structure. These two symphonies contain large-scale first movements, whereas roof-raising Finales appear not to have been Price’s concern. No. 4’s quarter-hour Tempo moderato nearly equals the length of the subsequent three. No. 1 includes a 12-minute Largo, but the last two movements of No. 1, and the remaining three of No. 4, are quickly passing dances or rondos. In each symphony, where we might expect a third-movement scherzo, we get a Juba Dance, recalling pre-Civil War slave tunes with syncopation. The closing movement of No. 4 is actually marked Scherzo. I wonder why Price didn’t consider something along the lines of a theme-with-variations to close her symphonies. Of course, we shouldn’t expect unwavering adherence to tradition or challenges at every turn. Crisply executed by the Fort Smith Symphony, this tuneful music is worth exploring not just because Price’s Symphony No. 1 was the first orchestral piece by an African American woman to ever be performed in concert (on June 15, 1933 by the Chicago Symphony Orchestra). 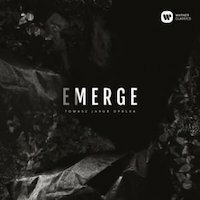 “Emerge.” Tomasz Jakub OPAŁKA: Collisions of the Matter (2012)1; Symphony No. 2, “Emerge” (2014)2; Bass Clarinet Concerto, “D.N.A.” (2012)3; Quadra (2007)4. Polish Sinfonia Iuventus Orchestra1,2, Krzysztof Slowiński1,2 (cond. ), Jadwiga Czarkowska3 (b-clar), Warsaw Philharmonic Artists “Chamber Orchestra of the Chain X Festival,”3 Wojciech Michniewski3 (cond. ), Polish Radio Symphony Orchestra4, Łukasz Borowicz4 (cond.). Warner Classics 01902 9 58832 2 5 (1 CD) (http://www.warnerclassics.com/). Opałka feeds an orchestra burning logs and embers. These scores present a satisfying blend of beefy orchestral massing recalling Wagner and Mahler, but with contemporary twitches and mutations akin to Lutosławski and Ligeti. Opałka’s style is somewhat consonant and we should not be surprised if film scores are in his future. At 13 minutes Collisions of the Matter is a bouncy glowing showpiece. Emerge will startle with an abbreviated bird call or murmuring forest before turning the corner onto brute force. There’s an angry march to the scaffold and a brief obsession with distorted tango bits. In D.N.A. the bellowing bass clarinet swerves in and out of the flashy orchestra. Taking cues from Varèse, Quadra unpacks high energy. These four pieces live within the ten-to-20-minute range, their similar durations obscuring the symphony and concerto in the batch. I’ll gladly listen to more, something at a lengthier scale. 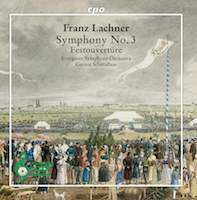 Franz LACHNER: Symphony No. 3 in D minor, Op. 41 (1833-34); Festouvertüre (1854). Evergreen Symphony Orchestra, Gernot Schmalfuss (cond.). cpo 555 081-2 (1 CD) (http://www.cpo.de/). At first hearing, Lachner’s sweet Third feels long winded as ideas are capably processed. However, the medium gravity (neither stern-faced like Beethoven nor bubbly like Mendelssohn) and smart orchestration (quick string passages balance steadier winds) can endear the nearly 50-minute symphony on subsequent spinnings. Why we don’t hear more from this forgotten German composer whose life and career (1803-1890) spanned much of the 19th century? He won acclaim in his day. The 1835 Fifth, “Passionata” or “Prize Symphony,” captured first place in a publisher-sponsored contest. Lachner calls to mind Gounod whose symphonies charm even if they do not innovate. The Overture can end with either the British or Austrian anthem and the latter rounds out this program. 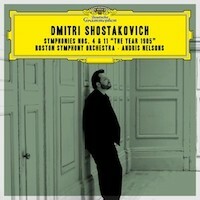 Dmitri SHOSTAKOVICH: Symphony No. 4 in C minor, Op. 43 (1936); Symphony No. 11 in G minor, “The Year 1905,” Op. 103 (1957). Boston Symphony Orchestra, Andris Nelsons (cond.). DG B0028595-02 (2 CDs) (http://www.deutschegrammophon.com/). Each of these symphonies commands its own disc, however, this pairing is not inexplicable. DG appears to be constructing its BSO / Nelsons’ Shostakovich cycle from the middle outwards. I expect the choral / vocal symphonies (Nos. 2, 3, 13 and 14) will appear together, and collecting Nos. 1 and 15 would make a logical finish. No. 4 ranks among the most progressive or modern scores Shostakovich produced, but it is not as much of an outlier as its history makes out. Because its scheduled premiere had been scratched, and the subsequent No. 5 considered a restorative effort, No. 4 is often considered an aberration, representative of a direction Shostakovich could not pursue. It does ramble, and compared to the tidier and more conventional No. 5, there are moments of unchecked anger and unfocussed transitions. Nelsons brings out superb wind intonation and emphasizes Mahlerian gestures which would bear fuller fruit in the subsequently appeasing No. 5. “The Year 1905” is equally grandiose, but bluntly programmatic, and here cool and distant. We know what each movement represents, and we can imagine the unexpectedly quiet Palace Square and the massacre of January 9 being projected upon a big screen. Perhaps the explicitness makes the music less powerful. Shostakovich had also wanted to draw parallels with the recently thwarted Hungarian Revolution of 1956. 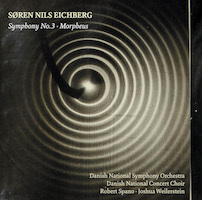 Søren Nils EICHBERG: Symphony No. 3 (2015)1; Morpheus (2013)2. Danish National Symphony Orchestra, Danish National Concert Choir, Robert Spano1, Joshua Weilerstein2 (conds.). Dacapo Records 8.226144 (1 CD) (http://www.dacapo-records.dk/). In eight movements, Eichberg’s energetic Symphony No. 3 is scored for orchestra, chorus and electronics. Dedicated to the composer’s father, who was ailing as the work was being created, the work wrestles with mortality and “seeking, questioning, losing, remembering and leaving…” Eichberg employs an approachable non-tonality as he sets questions posed by Qu Yuan and a mourning Hebrew poem. The work attempts to orient humanity within the universe; electronics include sounds captured by the Voyager probe on its space travels. There are also structures and repeating note clouds that reflect algorithmic creation which imply that nature follows unknowable patterns. The symphony ends positively with hummed version of a Danish lullaby even though no questions are answered. Morpheus is purely orchestral, a robust Concerto for Orchestra intended for the Danish National Symphony. The seven movements are extroverted where the Third wasn’t. With bold rhythms, motives that recall the prior century’s primitivistic warhorses, and rock opera gestures, I can see these being appealing pieces for American audiences (the First and Second symphonies, on Dacapo 8.226109, tap the same vein). The Third’s gravity suggests Eichberg will mature dramatically. 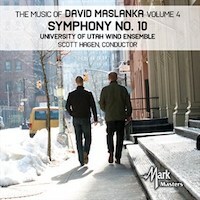 “The Music of David Maslanka Volume 4.” David MASLANKA: First Light (2016); The Seeker (2016); Symphony No. 10, “The River of Time” (2017; compl. Matthew MASLANKA, 2018). University of Utah Wind Ensemble, Scott Hagen (cond.). Mark Masters 54044-MCD (1 CD) (http://www.markcustom.com/). Maslanka’s wind ensembles make one forget there are no strings in the room, a trick that succeeds because of precise intonation and a wealth of ensemble colors. First Light and The Seeker are short assertive pieces, elegantly collecting soaring melodies, brisk rhythms, and spot-lit solos. First Light optimistically contrasts “perseverance – first light” against “unforgettable wounds – darkness.” In The Seeker, Maslanka gazes upon bodhisattvas for enlightenment. The composer’s note for The Seeker reveals the inclusion of J.S. Bach’s chorale “Christe, der du bidst der Tag und Licht.” Taking Bach’s example, Maslanka skillfully employs counterpoint and melodies progressing at different tempos. Symphony No. 10 was completed by David’s son, Matthew. The son’s program note is a touching description of the terrifying journey and process. The River of Time is a sober work, as much David’s valedictory as Matthew’s memorial for both his parents. The first movement is titled Alison, after David’s wife / Matthew’s mother. The third movement is titled David and was the most difficult for Matthew to realize. The final movement, “One Breath in Peace,” leverages chorales. Bittersweet and well worth getting to know. “Horizon 6.” Detlev GLANERT: Frenesia (2013)1. Michel VAN DER AA: Violin Concerto (2014)2. Luc BREWAEYS: Along the Shores of Lorn (2005)3; Symphony No. 6 (2000)4. Louis ANDRIESSEN: Mysteriën (2013)5. Janine Jansen2 (vln), Royal Concertgebouw Orchestra, Xian Zhang1, Vladimir Jurowski2, Otto Tausk3, David Robertson4, Mariss Jansons5 (conds.). 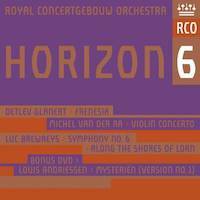 RCO Live 15001 (1 SACD, 1 DVD) (http://www.rcolive.com/). The RCO has been bundling a season or two’s new pieces together confident that these bold slices can stand on their own. The Horizon series now stands at eight volumes. Opening installment six, Glanert’s tumultuous Frenesia delightfully showcases the Royal Concertgebouw. The shape and character of Strauss’ Ein Heldenleben poses in the background. Lurching motives and quicksilver changes recall Glanert’s mentor Henze. Unusually for Van der Aa, this passionate Concerto contains neither electronics nor video. Jansen provides plenty of theater across three unexpectedly conformant movements. A bonus disc offers a video of Andriessen’s Mysteriën. Andriessen’s vocabulary has softened in recent years, and here he has succumbed to writing for a most traditional ensemble. There are no guitars; there’s a modestly sized string section. But there are microtones, and two pianos bolster the prominent winds. The composer’s late father (Hendrik, also a composer) appeared in a dream encouraging Andriessen to accept the commission from an organization he had once challenged with a disruptive performance action. Writings by Thomas à Kempis, from a volume owned by Hendrik, inspired the six sections.